In 1988, when I was in China, the population at that time was roughly 1.102 billion strong. In 2012, that number had increased to 1.351 billion people. Now, that’s a lot of rice, a lot of bicycles, and a lot of wonderful cuisine! China is such a vast nation that it is difficult to do justice to it with a short visit, however, in my whirlwind tour, I was able to see some of the sights of Beijing, Tianjin, Changchun, Chengdu and Guangzhou. I was traveling as a guest of a Canadian community college delegation, so I had no part in planning our itinerary, but it made no difference. What I saw was breathtaking and awe-inspiring, and the food? Well, read on! Perhaps the most incredible part of the trip was Beijing, formerly Peking. 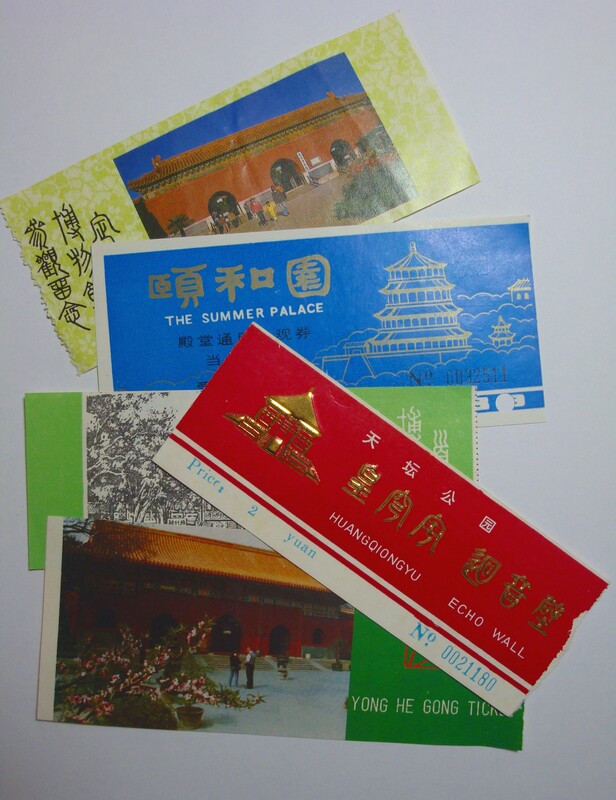 The Imperial Palace, also known as The Forbidden City, was constructed from 1406 to 1420. The last Emperor, Pu Yi, was overthrown there by the Japanese in 1911. 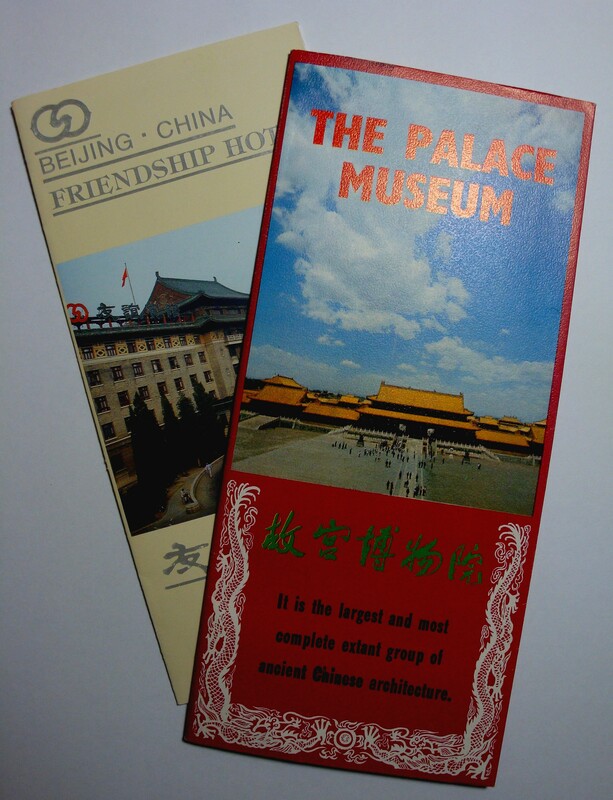 The palace covers an incredible 250 acres and is a fantastic museum with art, jewelry, paintings, bronzes, ceramics and more from the Ming and Qing dynasties, not to mention the buildings themselves. The Great Wall of China is just that and it is impossible to comprehend the extent of it. It was built from the 5th century B.C. and continued until 221 B.C. It traverses 3,700 miles and it is said that 300,000 men laboured to build it. There are so many sights to see just in the area around Beijing: The Summer Palace, built in 1750 during the Qing Dynasty, the Temple of Heaven, constructed in the 15th century, the Temple of Confucius, built in 1302, Ming Tombs, and much more. Tianjin is mostly known as an industrial city and is a primary location for the gorgeous wool and silk carpets that frequently adorn hotel lobbies around the world. In addition, Tianjin Zoo was a special delight, as there were 3 resident Panda Bears, all within arms length of the visitors. I recall lining up at the Metropolitan Toronto Zoo in the 1970’s for hours at a time, to see 2 Pandas on loan from China, and then, from a considerable distance. The Tianjin Zoo was a special treat. Changchun was the location of a “palace” built for Pu Yi by the Japanese, during military occupation, however, he allegedly refused to live in it. Chengdu is the capital of Sichuan Province and is known for it’s beautiful silk embroidery factories, where young women hand sew each piece. As guests, we were routinely presented with the potent fire breathing Mao-tai, made from fermented sorghum, which ranges from 35% to 53% alcohol! Each and every time a host would toss back his drink and shout “Gambei!“ (bottoms up), the guests were obliged to do so as well in order to avoid embarrassing the host. Fortunately, we were always chauffeured around and no one had to negotiate a bicycle! The Chinese also produce a number of excellent beers. There were lunches, dim sum, banquets, snacks coming at us continuously and it was a considerable array of incredible foods. The communal tables were always round (so no one felt more important than anyone else), and dish after dish of tempting vegetables, soups, rice, fish, meat and desserts were forthcoming. Dinner always seemed to end with what we began calling “the big dead fish”, which we knew would signal an end to the decadent meal we had just consumed. Sometimes, however, the soup came last and threw us for a loop. Not only is Chinese cuisine varied, but it is also beautifully presented and nowhere is it more true than in China that we eat with the eyes. Masterfully prepared garnishes, carved fruits and vegetables were everywhere. 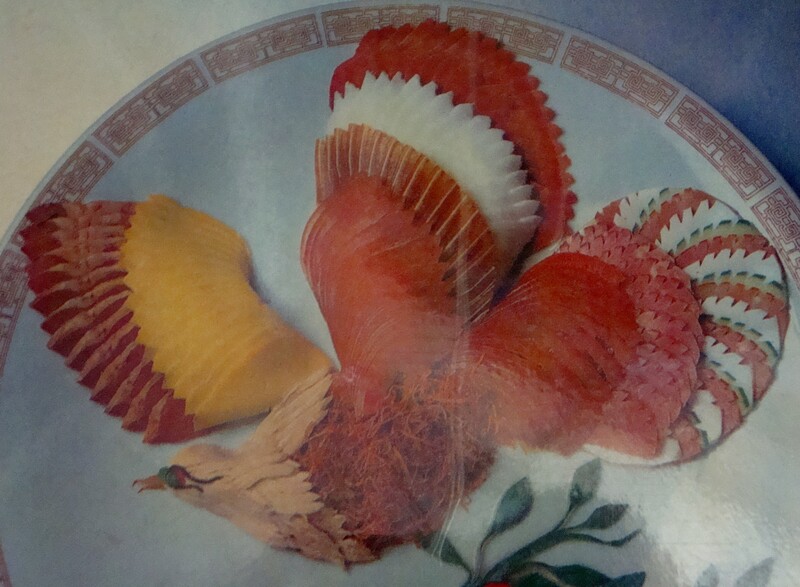 With nearly 200 Chinese cookbooks in my collection, I was hard pressed to select one, which I recalled so vividly, while I ate my way around parts of China. 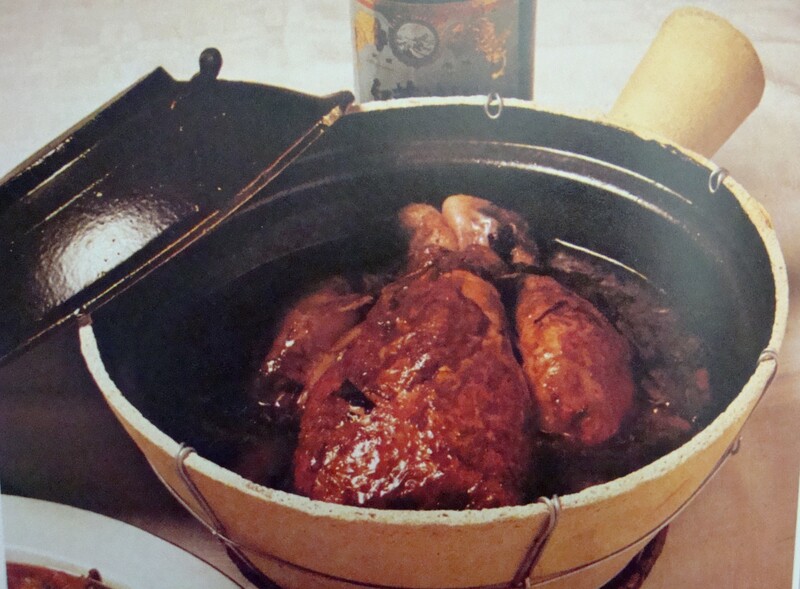 Below is a recipe for “Kwei-Fei Chicken”, or “Drunken Chicken”, which comes from “Chinese Regional Cooking” by Deh-Ta Hsiung, published in London in 1979. Yang Kwei-Fei was an empress during the Tang dynasty (A.D. 618-907). She was not only noted for her beauty, but her fondness for alcohol. Whether this dish actually had anything to do with her is not clear. Clean and dry the chicken. Mix 2 tablespoons each of soy sauce and rice wine or sherry and pour it all over the chicken, inside and out. Heat the oil in a deep fryer and fry the chicken with onions until golden, then immerse the chicken (keep the onions for later), in a large pot of boiling water for 3 minutes. Transfer the chicken to another large pot or casserole (the Chinese used sand-pots), add the remaining soy sauce, rice wine or sherry, salt, Chinese red wine or port and the chicken stock, as well as the onions. Simmer very gently for 2 hours, turning several times during cooking. Serve in a large bowl or in the casserole itself. This dish is reminiscent of the French Coq au Vin. Another wonderful Chinese to English translation in my hotel room. 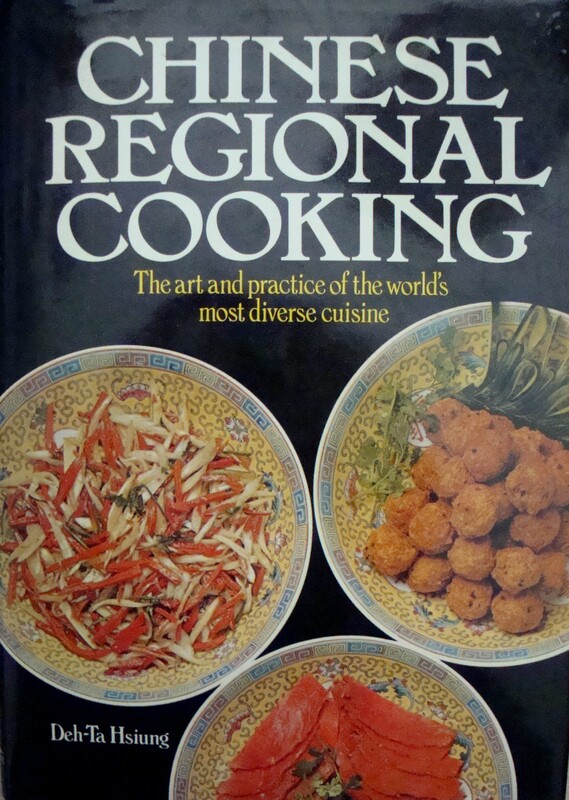 This entry was posted in Cookbooks, Cooking, Cooking and Social History, Cooking Technology, Eating, Recipes, Uncategorized and tagged Beijing, Chengdu, Chinese Cooking, Chinese Cuisine, Cookbook, cookbooks, Cooking, Dongguan, food history, Peking, Pu Yi, Sichuan, social history, Sue Jimenez, The Great Wall of China, Tianjin, time capsules. Bookmark the permalink.